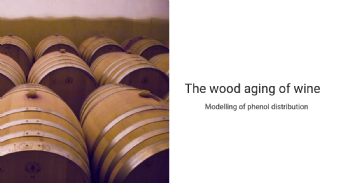 The wood aging of wine carries out several functions of which the main one is the slow and limited contact with oxygen in relation to the oxidation of phenols released from the wood itself. These compounds have a redox potential lower than the wine phenols, anthocyanins in particular, and consequently they are protected against the oxidative degradation. The dynamics related to the interactions between oxygen and ellagitannins are not completely clear and their knowledge could allow the proper choice of the cask and its management during the aging. The oxygen dissolved in wine during the aging in barrique is estimated around 10-50 mg/(L x year). However, the measure of the oxygen permeability of wood is still unknown. The aims of this research were to evaluate the distribution of phenols released from wood and the permeability of oxygen of the wood.